HMH Books for Young Readers, 9780152018481, 44pp. Pirates have green teeth—when they have any teeth at all. I know about pirates, because one day, when I was at the beach building a sand castle and minding my own business, a pirate ship sailed into view. So proclaims Jeremy Jacob, a boy who joins Captain Braid Beard and his crew in this witty look at the finer points of pirate life by the Caldecott Honor–winning illustrator David Shannon and the storyteller Melinda Long. Jeremy learns how to say “scurvy dog,” sing sea chanteys, and throw food . . . but he also learns that there are no books or good night kisses on board: “Pirates don’t tuck.” A swashbuckling adventure with fantastically silly, richly textured illustrations that suit the story to a T.
MELINDA LONG is a teacher and the author of the award-winning bestseller How I Became a Pirate. She lives in Greenville, South Carolina. 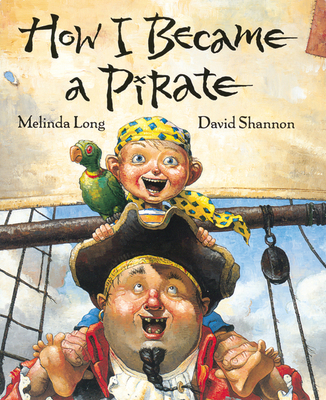 DAVID SHANNON is the illustrator of many popular picture books, including How I Became a Pirate. His numerous awards include a Caldecott Honor for No, David! He lives in Burbank, California. "Caldecott Honor-winner Shannon spices up this spirited pirate tale with vivid, appropriately zany acrylics." "Long's dry, tongue-in-cheek humor serves as an ideal springboard for Shannon's gleefully madcap illustrations." "Shannon's illustrations... are a page-turning glory. Long's clever and spirited text leaves other pirate books in the bilge." "Readers will be blown away by this rowdy gang, depicted in richly robust, humorous paintings."